Occasionally Youtube has some pretty interesting videos that are not just about cats falling or going into things, although those are still just great. Here are some silver screen training movies that run the gamut of suspiciously pure propaganda, to cartoons that are surprisingly technical and some of them answer questions I never knew I had, such as how would people cope with being in a sinking submarine and what did Dr Seuss do doing during World War 2? Signal Corps Instruction Movie "Crack that Tank" on antitank tactics, with a classic Hollywood Officer drinking beer. Shoulder patches suggest Staff Sergeant, not that I would know. Resisting Enemy Interrogation, 1944. Insidious and bleak. Land and Live in the Desert 1945, I became invested in the fates of Bob and Skipper. For soldiers under stress they are quite polite. There are a whole series of these, Sea, Jungle & Arctic. Nothing about how to survive in an urban environment like Karangahape Road, Auckland though, (essential advice, do not make eye contact). Submarine Escape. "Experts at grabbing sack time." vs chlorine leak. Actually quite sophisticated procedure with variation of practices according to urgency. The SEA's are multipurpose. Described hazards, oxygen poisoning, anoxia, decompression sickness and excitement, you know, assuming there are no obstructions and everything goes to plan. Mel Brooks on B-17 Gun Sight Theory Surprisingly Technical. Private SNAFU on "Booby Traps" , with the obvious pun. Private SNAFU on "Going Home", that sounds like Dr Seuss's writing. Actually pretty good advice. 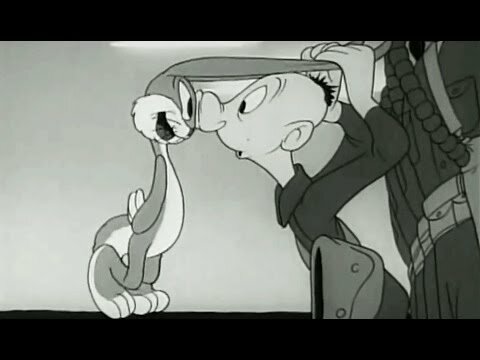 Private SNAFU on "GAS" with Bugs Bunny. "Do you think that man could do with some more training?" Private SNAFU on "Spies", again sounds like Dr Seuss's writing. Also, to contemporary standards not particularly politically correct. Private SNAFU on "Gripes", yet again sounds like Dr Seuss's writing. "Technical Fairy First Class". There are a whole series of SNAFU movies, apparently all voiced by Mel Brooks, which is why it sounds like Bugs Bunny, they are sort of definitely made for adult males and probably in the circumstances of their intended audience, they would sort of, definitely grab my attention.